In very dry conditions: Threshold tables for lygus indicate that if canola is $12 per bushel and spray costs $8 per acre, the threshold at the early pod stage is 5 lygus adults or late instar nymphs per 10 sweeps (0.5 per sweep). In moist and high-yield conditions: The economic threshold is quite a bit higher. At early pod stage, 50 lygus per 10 sweeps (5 per sweep) could cause a 2 bu./ac. reduction in yield — which could be a more suitable economic threshold in this situation. At late pod stage (the last week or so before cutting), pods are too tough to penetrate. In dry conditions, existing lygus threshold tables are still appropriate when making spray decisions. These tables indicate that if canola at the pod ripening stage is $12 per bushel and spray costs $12 per acre, the threshold is 11 lygus adults or late instar nymphs per 10 sweeps (~1 per sweep). 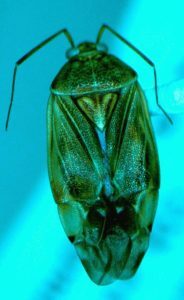 In very dry conditions: If canola is $12 per bushel and spray costs $8 per acre, the threshold at the early pod stage is 5 lygus adults or late instar nymphs per 10 sweeps (0.5 per sweep). In moist and high-yield conditions: The economic threshold is quite a bit higher. At early pod stage, 50 lygus per 10 sweeps (5 per sweep) could cause a 2 bu./ac. reduction in yield. 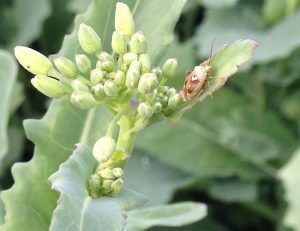 In dry conditions: Threshold tables for lygus indicate that if canola is $12 per bushel and spray costs $8 per acre, the threshold at the early pod stage is 5 lygus adults or late instar nymphs per 10 sweeps (0.5 per sweep). In moist and high-yield conditions: The economic threshold is likely quite a bit higher. At early pod stage, the lowest action threshold to consider in good growing conditions could be 10-20 per 10 sweeps (1-2/sweep). At the late pod stage, 50 lygus per 10 sweeps (5 per sweep) at could cause a 2 bu./ac. reduction in yield — which could be a more suitable economic threshold in this situation. Lygus have piercing, sucking mouth parts, which they use to pierce pods and drain immature seeds. This is where the major yield loss occurs from lygus. 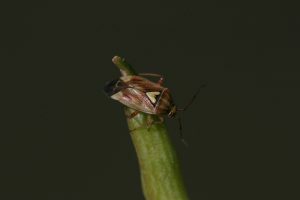 Three main lygus species are pests of canola in Canada. Colour and shape are somewhat different, but each should be counted equally when sweep netting and making spray decisions. This one is the most common, L. lineolaris. Lygus nymphs: Which ones do you count? When doing lygus counts, include adults and late instar nymphs. Nymphs are young lygus, and only the larger nymphs do enough damage to be included in sweep net counts. A key feature is the black dots on the back. Count nymphs with dots. Don’t count them if they’re small and don’t have the dots (like the one above). 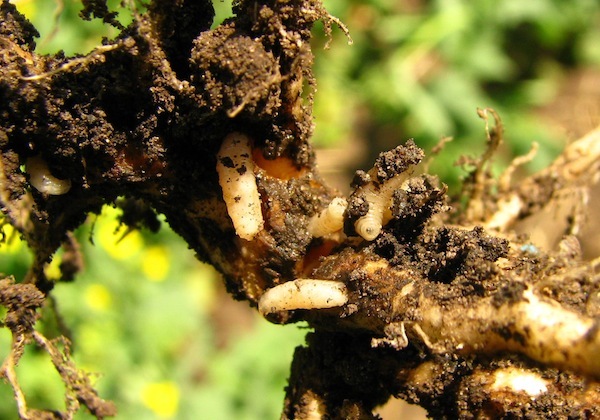 Lots of insects are being reported, but agronomists and growers are generally doing a good job of assessing the economic threat and determining that most situations this week do not require a spray. Given the patchy nature of most insect patterns, all fields should be checked. If something is spotted that may be above thresholds, check a few areas of the field before making the final decision.